Leanne Shoup, left, and Allie Kneisler show the barn quilt they painted for display and sale at the Osage County Fair. The Lyndon Leaders 4-H Club had an eventful month of February. First off, they had their monthly meeting on Feb. 12, which included project talks given by Leanne Shoup and Reanna Marcotte. Leanne shared her first sewing project, a wall pocket banner. Reanna talked about her experience with raising a new puppy. Recreation was led by Mason and Bryson Wise, and included an entertaining game of hot potato. 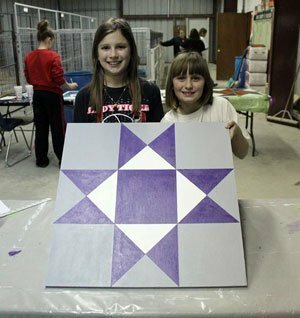 On Feb. 10, Allie Kneisler and Leanne Shoup met other 4-H club representatives at the Pavilion in Osage City to work on making a barn quilt. Each club is making their own barn quilt, which will be displayed during the Osage County Fair. They will then be sold at the livestock auction at the fair, as a fundraiser for the Osage County Fair board. This was their first experience with this craft and they really enjoyed the outcome of their hard work! To wrap up the month, club members gave demonstrations or project talks to the after school program at Lyndon. This gave them extra practice in public speaking and also allowed them to prepare for their talks at Club Days, which is on March 4, at West Franklin High School. They also enjoyed the opportunity to share their 4-H experience with others!